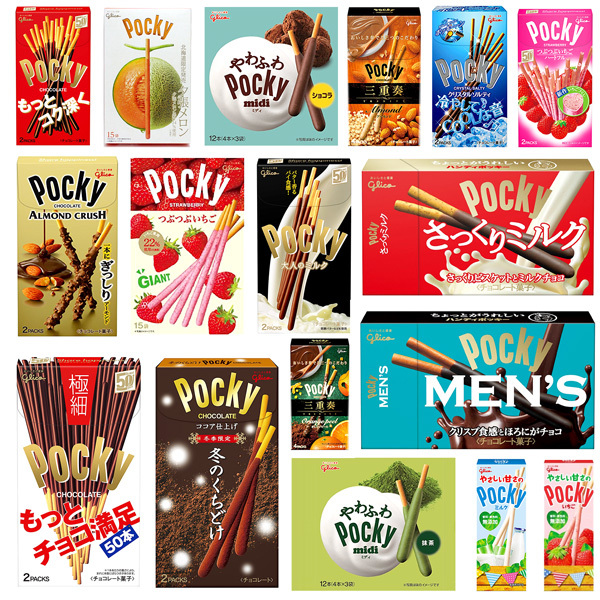 How much does pocky cost in Japan? 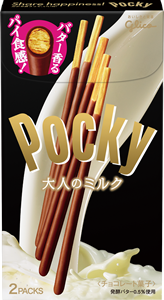 Pocky purchased outside of Japan can be quite expensive. 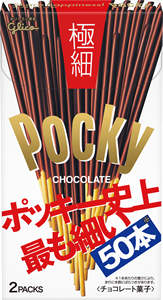 So, how much does Pocky cost in Japan? 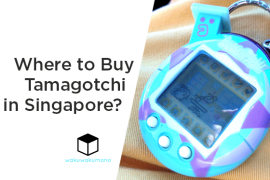 Not much… You can purchase one for about $1.30. 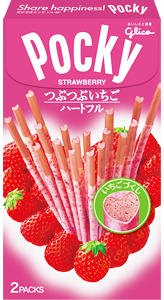 Here are a list of Pocky and the cost for each of them when purchased in Japan. 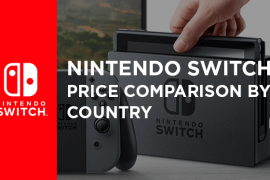 Prices are culled from various Japanese websites. 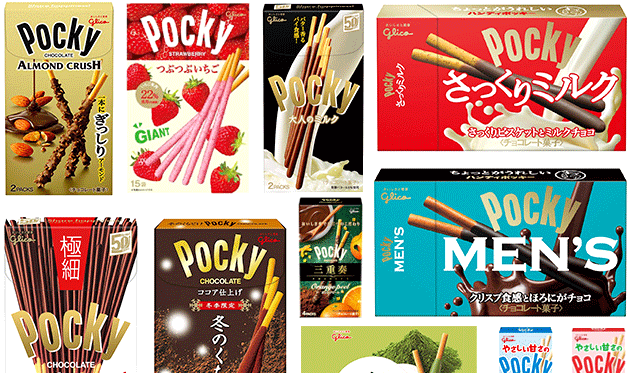 Check out our brand new Snacks & Sweets online shop to order directly from Japan. 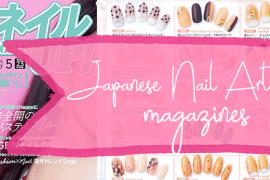 We ship internationally, so please ask us for a quote. Link to the Chocolate category. The Classic! Chocolate coated with rich pretzel baked to a light texture. 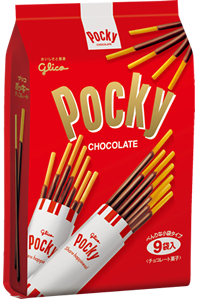 Half the size compared to the regular Pocky chocolate. Each box contains 50 sticks. Rich milk chocolate pretzel with a pie taste, which has been fermented with butter mixed and baked. 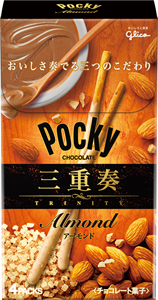 Luxurious Pocky that you can taste milk chocolate and the almond. 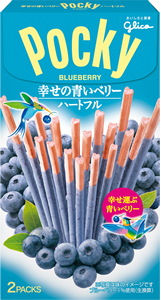 Blueberry flavored on a pretzel with pink-colored strawberry pulp. 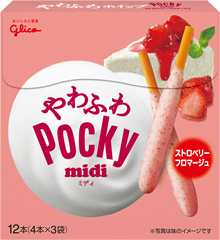 Sold in convenience stores only in Japan. 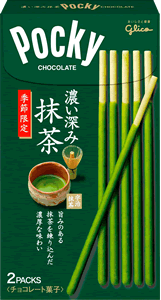 Green tea chocolate with two kinds of Matcha. Covered with crushed biscuit with whipped chocolate. Covered with whipped biscuit and chocolate. Released on December 27th, 2016. Available for a limited time. Why Trinity? 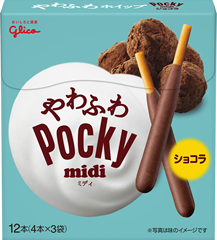 You have the rich almond cream coated on top of the crunchy biscuit stick, and then sprinkled with sea salt. Available for a limited time. 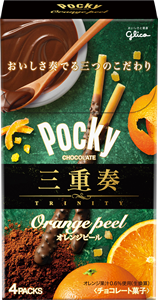 Stick with orange zest coated with chocolate cream made of cocoa power. Coated milk chocolate in a biscuit. Limited Edition crisp chocolate. 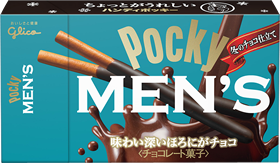 Labeled as Men’s to attract more male consumers. Not necessary only for men, though, so feel free to try to while it’s available for a limited time. 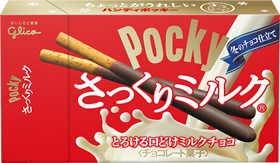 Pocky with condensed milk. Small enough to carry anywhere! Really! 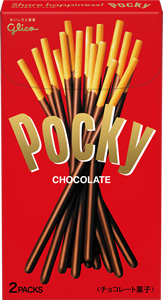 Classic Pocky chocolate. Contains 9 bags inside. 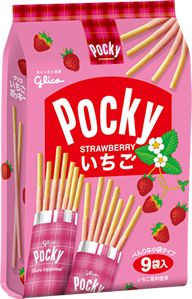 Classic strawberry Pocky. Contains 9 bags. 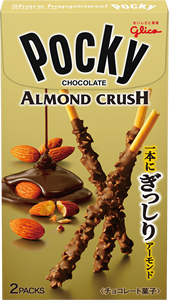 Pocky Chocolate supervised by Chef Tsujiguchi. Fruity champagne with mild milk chocolate.